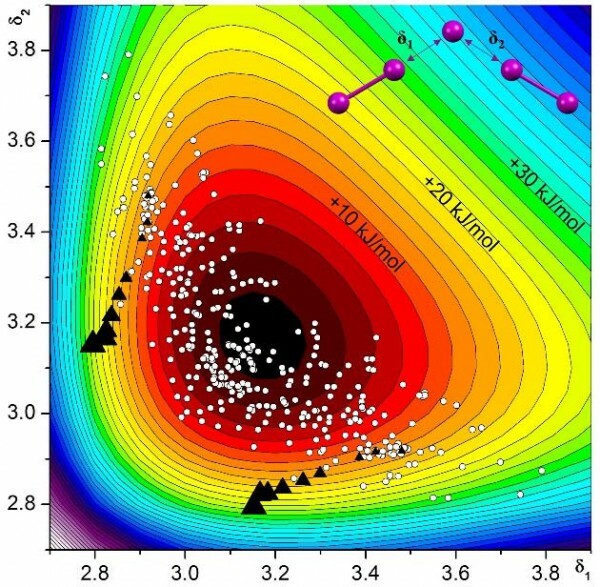 In this study, researchers led by Prof. Piero Macchi, experimental group leader in MARVEL’s Design and Discovery Project 4 and head of the laboratory of chemical crystallography at the Department of Chemistry and Biochemistry of the University of Bern, and Dr. Nicola Casati, group leader of the Materials Science group at PSI, used powder and single-crystal X-ray diffraction, electrical conductivity, and first principle calculations to investigate the response of one polyiodide, tetraethylammonium di-iodine triiodide (TEAI), to compression achieved by mechanical pressure. circles represent entries in the Cambridge Structural Database containing I5-. Compared with the chemical pressure, external mechanical pressure affects the crystal inter- and intramolecular landscape more substantially—a huge lattice strain may induce phase transformations and even chemical reactions. Using diamond anvil cells, it is possible to achieve pressure on the order of tens of gigapascals, a pressure that significantly changes the Gibbs energy, increasing internal energy. Similarly large energy changes are not possible through temperature alteration in solids. Though complementary I3- and I2 units are clearly separated and interact mainly electrostatically at ambient pressure, the researchers found that compression stimulates their approach—theoretical calculations show that the covalent contribution increases when the material is compressed. Ultimately, this leads to the formation of CT chains, and drastically increased conductivity.